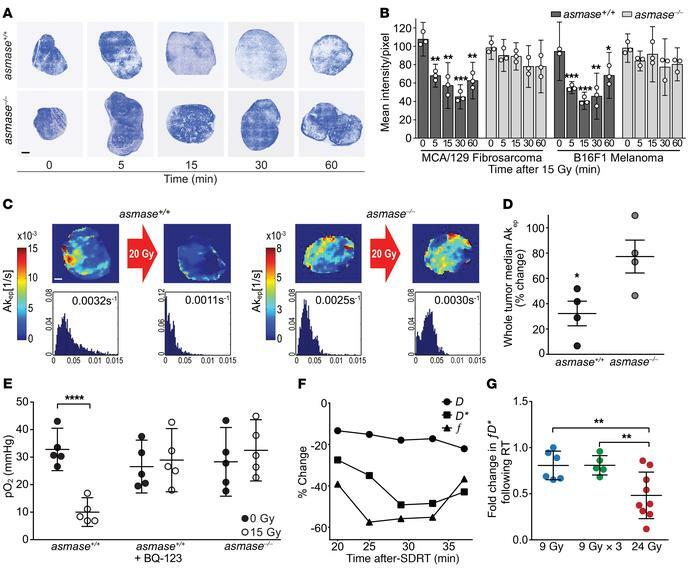 SDRT induces I/R in tumor microvasculature. (A) Representative fluorescent Hoechst 33342 accumulation in the interstitial space of fresh-frozen sections of B16F1 melanoma, injected at indicated times after 15 Gy SDRT; tumors were removed 2 minutes later. Blue regions are perfused and white regions are hypoxic. Scale bar: 1 mm. (B) Tumor perfusion reconstructed from whole-section mounts of tumors exposed to 15 Gy SDRT, quantified pixel by pixel by Hoechst 33342 fluorescence intensity. Data represent mean ± 95% CI collated from 2–3 mice per time point. *P < 0.05, **P < 0.01, ***P < 0.001, vs. unirradiated controls, Bonferroni correction (threshold: α = 0.05/4 = 0.0125). (C) Tumor perfusion assessed by DCE-MRI–derived Akep in B16F1 melanomas before and 30 minutes after 20 Gy SDRT. Color-coded Akep intensity heatmaps (top) and respective Akep histograms (bottom) are quantified pixel by pixel across a representative 1-mm DCE-MRI slice, expressed as median Akep values. Scale bar: 1 mm. (D) Each dot represents perfusion reduction from 1 mouse implanted with B16F1 melanoma, reconstructed from whole-tumor Akep histograms normalized to preradiation values (4 mice per group). Data represent mean ± SEM. *P < 0.05. (E) Effect of SDRT on MCA/129 fibrosarcoma pO2 quantified by the OxyLite method. Data represent mean ± 95% CI before versus 30 minutes after 15 Gy SDRT (5 mice per group). ****P < 0.0001 vs. unirradiated, paired 2-tailed t test. (F) DW-MRI–derived IVIM coefficients in a patient receiving 24 Gy SDRT for primary prostate cancer. Time-dependent changes of f and D* register I/R after SDRT. (G) Fold changes in fD* in oligometastatic bone lesions exposed to 24 Gy SDRT, 9 Gy or 3×9 Gy radiotherapy. Data represent mean ± SD of 16 repeat fD* values per point. **P < 0.01, Bonferroni correction (threshold: α = 0.05/2 = 0.025).